There is plenty on in Jerusalem for retirees. OU Israel Center. Click on here for details. Pardes. Click on here for details. ELC. Click on here for details. Bet Knesset Hanassi. Click on here. Thursday morning Torah Mi’Tzion Kollel at Nitzanim Shul, Rechov Asher, 9am-12pm. In English and mixed. Support Group for Women who are Caring for a Spouse with Dementia- Rena Meriash-Levine and Ellen Sucov invite women and men who are caring for a spouse with dementia to a bi-monthly support group. The main focus of the group will be dealing with the challenges of caring for a spouse with dementia, and helping each other find solutions.12:30. Meetings are free of charge. Call AACI, 02-566-1181 for details. Classics Reading Group – Seize the Day by Saul Bellow Led by Dr. Judy Oster. 13:30 at AACI Glassman Family Center, 37 Pierre Koenig, Talpiot. Ongoing Mah Jongg Club for Experienced Players- For experienced players. Sundays, 15:30- 18:00. NIS 10 per week. At AACI Glassman Family Center, 37 Pierre Koenig,Talpiot. Understanding Bituach Leumi– An overview of the benefits and services offered by the National Insurance Institute to residents of Israel. Understand your obligatory contributions and the relationship between Bituach Leumi and health coverage. This workshop will NOT be dealing with Old Age benefits. Presenter: Sheila Bauman, AACI Jerusalem’s klitah counselor. Cost: NIS 20/ free for AACI members. 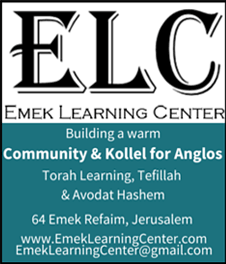 10:00 at the AACI Glassman Family Center, 37 Pierre Koenig, Talpiot. Bridge for Experienced Players – Come enjoy the challenge! At 13:00 PM At AACI Glassman Family Center, Pierre Koenig 37, Talpiot. For information and registration, call 02-566-1181. Feldenkrais for Healthy Backs and Joints– Discover your body’s natural ability to move with greater ease, releasing chronic tensions and learning to develop efficient and flexible movements. The students are guided through a sequence of gentle movements, discovering new possibilities of movement with reduction of pain and stiffness. Taught by Shoshanna Lederman (050-752-6631). certified Feldenkrais practitioner, M.A. education, Bank Street. 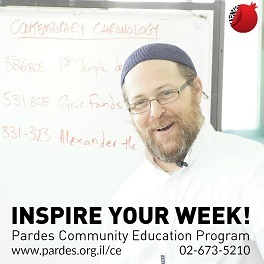 Mondays at 10:45- Cost NIS 50/ 40 AACI members. At AACI Glassman Family Center, 37 Pierre Koenig, Talpiot. Health & Wellness Networking Forum: Topic- Social Anxiety – the Hidden Disorder? What is social anxiety? Why is it hidden? Is it a disorder? These are just three of many more questions & answers which we will discuss. Join us to help understand or assist a family member, friend, colleague or yourself, or to understand why they’re so quiet or stay away from parties. Speaker: Miriam Drori – An olah vatika of forty-two years and publisher of three books, including a non-fiction book on social anxiety. 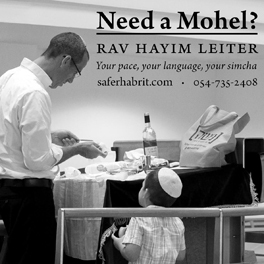 Cost: NIS 40/ 30 AACI members.17:30-19:30 at AACI Glassman Family Center, 37 Pierre Koenig, Talpiot. 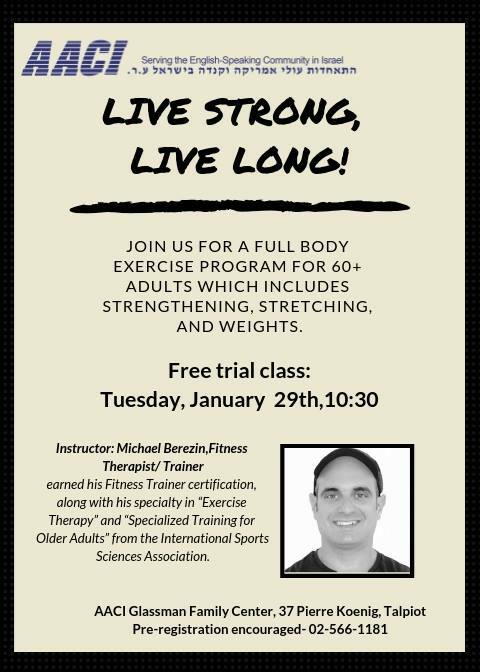 Live Strong, Live Long Trial Class- Join us for a full body exercise program for 60+ adults, which includes strengthening, stretching, and weights. Instructor: Michael Berezin, Fitness Therapist & Trainer. 10:30 at the AACI Glassman Family Center, 37 Pierre Koenig, Talpiot. Little Lotus Kids Yoga – Come learn yoga poses while having a blast! We combine music, dance, and games with classic yoga poses to encourage kids to stretch, strengthen, balance, and relax their bodies. We end each class with breath work, massage, and relaxation time. Parents and kids have a chance to practice yoga together and share this wonderful experience. Instructor: Sara Levin. The class is geared towards 2-4 year olds and their parents. 16:30-17:30 . Cost: NIS 40/35 AACI members per session. At AACI Glassman Family Center, 37 Pierre Koenig,Talpiot. Exercise 50+ – Marilyn Cohen leads a class tailor made for the mature adult, focusing on strength, bone density, and more. The class is great for balance, and can be done standing or sitting. 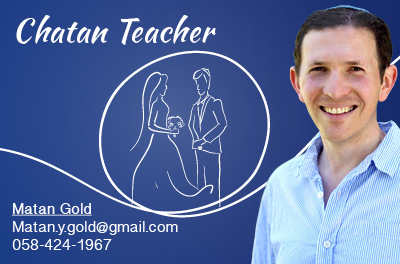 8:30 & 9:45 At Glassman Family Center, Pierre Koenig 37, Talpiot. Cost per week: 55 NIS/AACI members NIS 45. For registration and information: 02-566-1181. In conjunction with AACI RAPS (Retired Active Persons),Irwin Blank will present: The Czech-Israel Arms Deak of 1948.11:00. Cost: NIS 10 which includes beverages and cookies. For further information, call 02-566-1181. At AACI Glassman Family Center, Pierre Koenig, Talpiot. Intro to Hassidut- Intro to Hassidut: Six Hasidic Masters– Who were the great Hasidic Masters, and what can we learn from them that will enhance our lives today? In this course we will focus on six spiritual giants, examine their context and biography and study some classic sections from their teachings. Thursdays, until – February 21st, 11:30. Cost:NIS 50/ 40 per session. Instructor: Rabbi Daniel Silverstein recently moved to Israel from Palo Alto, where he was Director of Jewish Life & Learning for Hillel at Stanford University. He received his ordination from Yeshivat Chovevei Torah Rabbinical School after several years of work in Europe & the US in the arts, education, & Muslim-Jewish relations. He is an accredited meditation teacher & regularly leads retreats and classes for partners including Pardes, the Homestead, Or HaLev, and the OU. Tai Chi-Yang Long form Tai Chi a is timeless, gentle way improve your body’s flow and destress, soothing body and mind. Taught by Nancy Harel. Thursday afternoons- beginners at 15:00, intermediate/ advanced at 15:45.Cost: NIS 45/AACI member NIS 35. At AACI Glassman Family Center, Pierre Koenig 37, Talpiot.